In early March, activists across 13 countries supported WALHI, Indonesia’s largest environmental network, in calling on Bank of China to withdraw financing from the controversial Batang Toru Dam in North Sumatra. If built, the dam would likely doom the newly discovered Tapanuli orangutan to extinction, as well as jeopardize the livelihoods of local communities that depend on the natural flow of the river. Actions were simultaneously coordinated across Spain, Belgium, the U.K., Ghana, Kenya, Mozambique, South Africa, Togo, Hong Kong, Philippines, South Korea, the U.S and Indonesia at Bank of China locations. Where there were no local Bank of China branches, activists raised their concerns to the local Chinese Embassy. As far as we are aware, this is the first time a Chinese bank has publicly responded to NGO concerns regarding an overseas investment — a tremendous achievement for all the organizations who supported WALHI by participating in the solidarity actions across the world. Chinese banks are notorious for failing to constructively engage with civil society overseas, and so hopefully, Bank of China’s response suggests a new appreciation of civil society. On another positive note, Bank of China has reached out to ape conservationists in the United Kingdom as a result of the international action. This is a very encouraging sign that the bank is taking into account civil society concerns. However, the bank has yet to contact WALHI, who are leading the on the ground campaign against the dam in Indonesia. On March 18, WALHI publicly asked Bank of China for an in person meeting to further discuss concerns in Jakarta. If the bank is serious in supporting environmental protection, it should consult and engage all stakeholders, including international and local Indonesian voices. This simultaneous action represents the first internationally coordinated demonstration against a Chinese bank’s overseas investment, and the bank’s investment could be the first Belt and Road project to trigger the collapse of an entire species. This is undoubtedly an uncomfortable distinction for Bank of China. According to its Environmental Policy, the bank regards sustainability at the heart of our-term competitiveness,” so it is puzzling why the bank has continued to finance a dam that would impoverish local communities — let alone most likely wipe out an entire species.. According to WALHI, there is no proof that the electricity produced by the dam would even improve energy access; instead, scientists have questioned whether the dam is necessary, and there is speculation that the energy would most likely be used to power a nearby gold mine. Indonesian activists from WALHI have attempted to flag the serious environmental and social risks of the project to the bank for at least a year. In 2018, WALHI attempted to contact Bank of China numerous times, but were brushed off or simply ignored. Meanwhile, the dam developer, PT North Sumatra Hydro Energy, began using explosives and bulldozing virgin forests, causing frightened animals, including orangutans, to flee the area. Troublingly, dam development continues while the project’s dodgy environmental impact assessment (which includes a forged signature) is still being contested in court, and PT NSHE continues to wage a campaign of misinformation. In light of this, the internationally coordinated actions against Bank of China exemplifies the public’s outrage and bewilderment with why Chinese banks would isolate themselves from receiving information and evidence of very clear project flaws , such as the environmental impact assessment’s forged signature, major gaps in assessing the seismic risks of building a dam near a major fault line, let alone the complete absence of adequate analysis on endangered species like the Tapanuli orangutan. Hopefully, Bank of China’s public response will lead to meaningful discussions with Indonesian civil society, like WALHI, about the dam’s very real threats to both endangered species and local people and serve as an example to other Chinese banks that interacting with civil society can be a positive and informative experience for all sides. 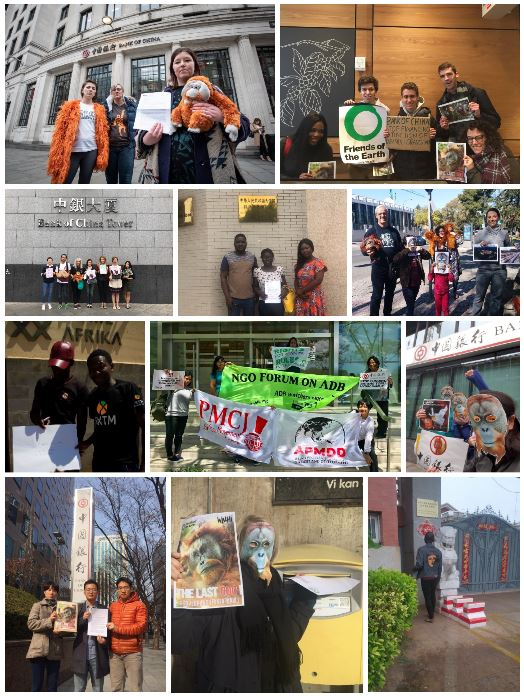 Friends of the Earth-International members delivered WALHI/Friends of the Earth Indonesia’s letter to the Bank of China branches in London, New York City, Hong Kong, Accra, Madrid, Nairobi, Manila, Brussels, Seoul, Stockholm and Lomé.Friends of the . This blog was cross-posted from Medium. View the original here, including the full gallery of images.